Brewer is a SPS Emblem peak. I was mildly disappointed when only three other climbers signed up for this memorable trip. I shot four rolls of 36 exposure film, as the photographic opportunities would have Ansel Adams coming back for more! We drove to Grant Grove to stay a night, car camping, then had a good breakfast at the nearby cafe. This was the morning of the start of our climb. Driving further east on Highway 180 to Roads End (elevation 5,000 feet), we parked, got our permit checked, then began with backpacks up the Bubbs Creek Trail. This trail heads along flat valley floor for two miles, then climbs up a rocky and sandy grade on the north side of Bubbs Creek. Crossing the bridge at the Sphinx Lakes Trail junction, we left the day hikers and tourists behind. The Sphinx Lakes Trail climbs up and up. It eventually goes over a 10,000 foot pass, then deep into the park backcountry. We having begun in clear weather, the dark clouds began to move in early in the day. There was some concern. I have good Gore-Tex rainwear, but one of the other climbers carried only a highly deficient form of nylon coated rainwear called a cagoule. Others had plain coated nylon. They choose cotton items as their wear of choice. 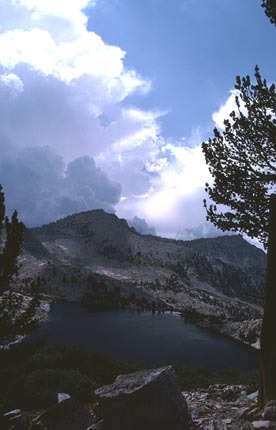 We reached the signed cutoff to Sphinx Lakes. As we hiked up through the trees, a cloud burst let loose. There was no way anyone would stay dry. One climber doffed all clothing except for his shorts, and took the rain's full force. I inquired about potential hypothermia, but due to the summer temperatures, exertion was enough to keep this person warm. We were to have thundershowers every day. 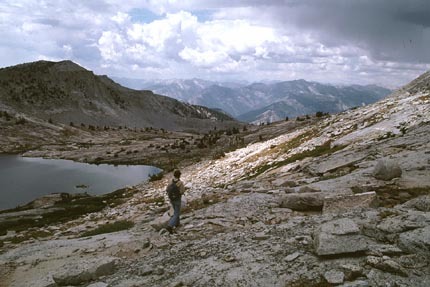 The weather cleared as we reached the Sphinx Lakes, and Dave took the lead, with the others following. Regarding my leadership, the others had simply silently revolted. I'll credit Dave as the effective leader of the group. The local chapter supports its members for whatever they do. I had partaken in similar revolts, but not without announcing my sign-off and position. It was all I could do to bag my peak and see the others return at the end of the trip. Even the campsite was set by Dave. Ejecting the rebels for their independent ways would only cost me my company. They were three together, and the chapter would support them. The sunset was gorgeous. We set up camp above the lakes, on some granite slabs with a high vantage point of the sunset. Wayne read a book, with clothing spread out to dry. I snapped a picture that doesn't really convey the glory of our high position, but would have to do. I had a waterproof tarp along, with no tent. The nights stayed dry. The next day, our summit day, the others were more civil, now, in allowing me to set the start time. We hiked over a rocky saddle, then had our view of the peak. It had gotten some fresh snow. The snow cross was distinct. Boulder-hopping over big granite talus, we came to the base of the class 2 north slopes. The others took off ahead. I carried my usual emergency bivouac gear, and they had light packs. Also, my five pound camera pack served to slow me down. They soon disappeared out of sight above. I followed tracks in the snow to the ice gully that forms the middle of the cross. They had crossed this gully, and I had a nervous moment on the hard, slick surface. I realized later that they had turned about on their route, and then re-crossed the ice. I had a delay in trying to be safe and to climb with care. Their group had three sets of eyes to check the route. I essentially was climbing solo. I topped out on the summit. The others had been there for some time. Dave ran over to and climbed a summit pinnacle, whooping and hollering. He was having a good time. Stating that it was class 4, none of the others chose to bag it. In my mind, it did look higher. I came back in 1994 to finish this climb by bagging this high rock. That was a point that stuck in my mind for years! 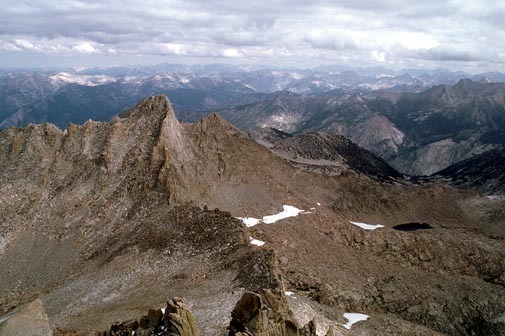 The group announced that they were going over to bag North Guard, an adjacent peak. I had to warn Wayne that the two others did class 5 unroped. He chose to go with them. So, I stayed on the Brewer summit, savoring the vista, and rested. I read through the Brewer register, and photographed interesting entries. Some renowned Sierra personalities had signed in. The others were well on their way to North Guard. Clouds were forming, but I enjoyed my solo time on the summit of Brewer. Finally descending, I worked carefully down the boulder field. Down a thousand feet from the top, I scouted out an approach to the summit of North Guard. The only route I could see ended in a steep, holdless area of slabs. The others had made the top, and I could hear them. They had signed out in an nebulous fashion, but I found a comfortable boulder to wait on. I wanted to make sure they got down O.K. Returning to our camp in mid-afternoon, we had more inclement weather. I took pictures of clouds welling up from the west. Spectacular! The sunset wasn't too bad either. The others were obviously better climbers, or, at least more daring in their own group. Two of them must be close friends. A lot of group dynamics must be involved in their joint decision to do what they wanted. For them, it must have been to hell with me, the official leader. One is a local chapter outings leader in his own right, even to this day. I had to worry that my driver, one of the group of three, might decide to leave me at the trailhead to make my own way home. That is supported by chapter policy. The Club takes no responsibility for transportation. The last day, starting in the early morning, we hiked back to the cars together. Arriving back to Roads End by about lunch, they decided to go for a swim in the Kings River. I could only agree. After the swim, we headed home, passing through Fresno. I shot a few more photos. It was hot in the Central Valley. Pleased that I had bagged a great peak, I could only thank my stars that I was safe. The local chapter bans any disciplinary measures against members and participants, except, apparently, for me in 1986-87. Some leaders will not go without friends on the trip. Being a representative of the Sierra Club, that places one in an adversarial position with some hostile persons automatically. There are no acknowledgements that this was my trip lead, and that they'd do exactly what they wanted, no matter what. I now have to weigh groups of people as to whether they'd take a ride, then vote to go for pizza and beer, and to Hell with the peak! Among us independent mountaineers, a trip remains a loose, temporary, affiliation, not binding in any way. One day, there may be problems, as in years later. The chapter decided to institute official training, but as an independent leader, you'd best have true climbing friends along.